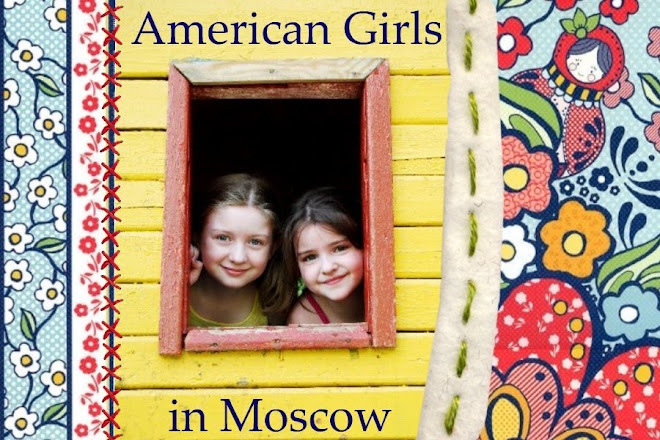 American Girls in Moscow: What a Deere! There's another VERY sweet picture with both of them turning around... I think of it as "Keep Your Eyes on the Road!!". If his mom says it's OK, I'll add it to this post tomorrow. I even heard her tell him, "I love you..."
The girls have never been able to have a Barbie Jeep so I bet the lure of the John Deere was very strong. Add in a cute boy, and ... 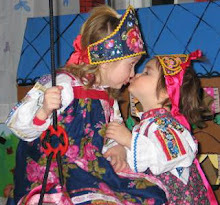 It's nice that Natalia has a friend to play with at Grandpa and Grandma Bravo's house. "Not even six and already won over by a fancy car". Priceless! does she go for younger boys? 'cause Ben drives his Gator ALL day long, and is always willing to let a girl hop in the passenger seat. Since you can't access your email, this works. Lots of things came in today's mail. Give me a call for a rundown (but not after 10:30). If Natalia went for a younger man and Katya hooked up with your older son, you and Tami would be in-laws! Oh No! Does this mean she's ditched the dolls? This poor little guy probably doesn't even know what he's set in motion...God Bless him! Don't worry. The American Girl dolls won't get ditched. They are a strong favorite. How could she not go for a cute boy with a convertiable though? Xander would absolutely love this.